GST introduced by government in place of 7 taxes like service tax, VAT, Central Excise from 1st of july, 2017. Offering Service Tax Compliance Services. 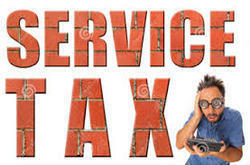 SimpliTax is one stop solution provider, for handling all compliances relating to Service Tax. Our Team takes care of your monthly/ quarterly service tax calculations, exemptions, deductions, Cenvat credit, documentation and all aspects of Filing Half yearly Service Tax Returns. G. K. Kedia & Co. Document: USER ID AND PASSWORD, ALL SALE PURCHASE BILL ISSUED ON BEHALF OF GST NO. We are offering an exclusive collection of Service tax Return Service to our valuable clients. These services are precisely offered in accordance with the set industry norms as per the requirements of our clients. Apart from this, we are providing these services at very affordable prices within the stipulated period of time.